To get ready for some serious hiking in August, I have been trying to get out and walk more often. Ryan always takes a long walk (7 miles or so) every day. So last night when I got home from working from Philadelphia to Seattle, I told Ryan I wanted to go on his Alki Walk with him. He was pretty surprised. I am usually too tired to do much of anything when I get home from flying. But I felt pretty good last night and it was a lovely night. Warm and clear. You could see lots of stars. We didn't realize how late it was until we were walking along Alki Beach and a police car drove up, shining his spot light on us and some other folks sitting on benches by the beach. "The Park is Closed, Move Along" blared over the loudspeaker. The Park is closed! What Park? The Beach? So we walked up to the "regular" sidewalk. About 12 yards away from where we had been walking. Arrgh. Seems as though the beach closed at 11pm. We continued our walk around Alki Point and saw great views of downtown Seattle. I also enjoy watching the ferry boats go back and forth when they are all lit up like miniature floating cities. Ryan likened them to miniature floating prisons. Because of all the lights that were on the boats! I didn't realize that prisons had lots of lights, but I guess they do. I was starting to get tired of walking, and we still had a long way to go to get back to my house. Ryan kept telling me that there was a 7-11 where I could get a cold drink somewhere on Harbor Drive. I did not believe him and he kept telling me it was just around the next bend. "where the Water Taxi pier is...no, well, where Salty's Restaurant is....no, well it's the next bend!!" At Alki Point the cops were back. This time with a tow truck and they were threatening to tow away cars. "No Parking after 11pm" blared over the loudspeaker. There were several couples walking like Ryan and me. There were also a few guys fishing along the breakwater. They scurried to move their cars. Ryan and I were walking and talking as we made our way past Salty's Restaurant and several cars passed us on their way to the Beach. Suddenly, as a car was going by, I heard some popping noises like firecrackers. Then pop, pop something hit in the bushes to our left. Ryan felt the breeze of something as it sailed past his nose! WE WERE SHOT AT! Well, it was probably a BB Gun, but WE WERE SHOT AT! It really freaked me out. If Ryan had been walking a little faster, they could have hit him in the eye. All my Nancy Drew training totally left my head. I can't tell you what the car looked like, I don't know the license plate number. I was totally in shock. Should we call the police? Where are the cops when you need them? They had been swarming Alki all night bugging the hell out of us. And now when we needed them, they were no where in sight. I started walking along with renewed vigor! I just wanted to get home. We finally did reach the 7-11. But I didn't want to stop anymore. We didn't call the police either. We didn't know what the car looked like. There wasn't much we could tell the cops about the hooligans. We just hoped that the police were still hanging around Alki and would deter the people in the car from any more mischief. This is what I get for going walking at 11 0'clock at night! We made it home safe and sound. Just another layover in Seattle for me! Ryan left early in the morning for Oregon and backpacking the Pacific Crest Trail. Since I was already up and awake, I thought I would go for a walk on Alki and get some mileage under my belt. We hike along Alki because it is easy. It is basically in my backyard. When you leave my apartment and walk straight down the hill towards the water, you hit the beach at Constellation Park. Nice flat beach to walk on for an easy 4 miles for me today! 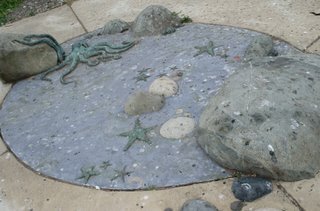 At Constellation Park, there is a really neat "tidepool" sculpture set in the sidewalk and access to the rocky beach. At lowtide, you can walk along the beach all the way around the point to the Alki Point Lighthouse. At hightide, it is better to walk along the sidewalk. But there is plenty to see along the sidewalk. Hollywood has their walk of stars and this is Seattle's walk of stars. However, ours are of the heavenly variety! They don't call it Constellation Park for nothing. 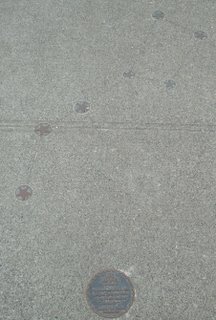 Embedded in the sidewalk are diagrams of a dozen or more constellations. From the Big Dipper and Leo to Orion and Scorpius. It's an astronomy lesson at your feet. Once you round the bend, you reach Alki Beach proper. Sand and firepits, picnic tables and volleyball nets. And a long line of restaurants, bars and coffeeshops. Sunfish: Fish and Chips is my Dad's favorite. Pegasus Pizza is another favorite of ours. Celtic Swell is the local Irish Pub! And Dukes Chowderhouse is where my sister, Alisa, and I had Thanksgiving dinner once. A monument marks the spot where the first white settlers landed here at Alki in the winter of 1851. They soon left and built their city across Elliott Bay on the less exposed shores of Seattle's current waterfront. The first Settlers named this area New York-Alki. New York because I think some of them were from New York and Alki was a native word meaning by and by. Hopefully, this area would be like New York by and by??!! Well, we do have a Statue of Liberty. It is usually standing around here somewhere, but she keeps getting her torch stolen. She is currently off for repairs in Tacoma. After the 9/11 attacks, the statue was a place that people would leave flowers, flags and momentos as a kind of memorial. Hopefully, she will be back soon. On down the beach is the site of Luna Park. Built in 1907, Luna Park was a seaside pleasure resort like the famous Luna Park on Coney Island in New York. There was a swimming pool, a dancing pavilion and a skating rink. They boasted of having the longest bar on the bay! And there was a thing called the Joy Wheel, The Joy Wheel looks alot like the swings in modern day amusement parks and fairs. There are viewfinders along the walk where Luna Park used to be located. Inside the viewfinder, is an image of the Joy Wheel. So you are looking out over Elliott Bay and you can see the ferry boats go by with the image of the Joy Wheel from 1907 in your eyes. Luna Park closed in 1913 and burned down in the 1930's, but if there is a very low tide, you can still see some of the pilings from when the pavilion was here. The last time that happened there was a huge traffic jam around West Seattle as folks drove over to get a glimpse of the pilings! All along the walk at Alki there are images embedded in the sidewalk about the native americans, the first settlers and the flora and fauna of the area. And then there are the views of the boats and islands and Seattle with the Space Needle in all its glory. 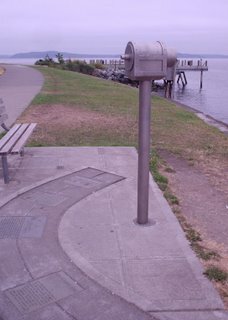 It all combines to make the Alki walk alot of fun. Plus stopping for a Starbucks or a Guiness at Celtic Swell isn't so bad either!